With headquarters in Huddersfield, VTL Group (www.vtl-group.com) is an international provider of precision components and assemblies for turbochargers, transmissions, engines and braking systems. It employs nearly 500 people worldwide and has revenues totalling more than £70m. The group won a major contract to supply a shift lever for the Toyota Yaris and Avensis gearbox. 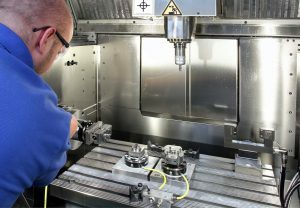 Existing machines on the shop floor could not cope with the volumes, so VTL invested £1.5 million in a new, five-machine cell to produce the automotive assemblies. Finding a process to produce one of the three shift lever components was problematic. The shape of the mild steel spline shaft dictated that it should be turn-milled on a sliding-head lathe, but on most available machines, the spline could not be included within the turning and milling cycle. So a second lathe would have been required to cope with production volumes. One machine on the market, however, the Traub TNL18/7 sliding-head lathe, was able to hob the spline in the main spindle while simultaneously reverse-end machining other features in the counter spindle. The lathe manufacturer’s UK and Ireland agent, Kingsbury, demonstrated how the part could be produced in one-hit in a cycle time of 60 seconds, whereas other types of slider on the market needed 120 seconds to complete the job. The Traub lathe was purchased in June 2013, along with a second 20 mm capacity Traub slider, model TNL18P, for producing two simpler automotive shafts in 32 and 20 second cycles respectively. These times are 18 and 29 per cent faster than on competitive lathes. Although the second machine has fewer CNC axes on the upper turret, it can produce the spline shaft in an 85-second cycle, which includes simultaneous hobbing and reverse endworking. The lathe therefore provides back-up for the TNL18/7.